Walking The Burren Way from Lahinch to Corofin, you will be rewarded with panoramic coastal vistas along the iconic Cliffs of Moher, one of the most spectacular views along the Wild Atlantic Way. 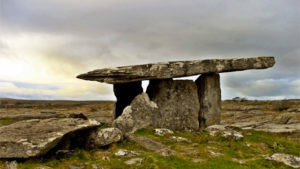 The Burren will open up on your way with its unique landscape, hundreds of acres of exposed limestone bedrock, interlaced with pockets of eco-systems supporting a diverse range of plant life. 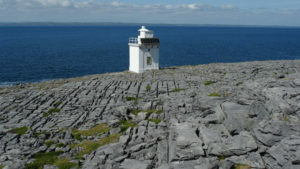 The word ‘Burren’ comes from the Irish word ‘Boíreann’ meaning a rocky place. This popular walking route follows the impressive Cliffs of Moher from Hags Head along the coast to Doolin and Fanore, continuing to the most northerly point of Black Head, before turning inland on a mountain pass. It will immerse you in the eerie barrenness that is the Burren. Descending from Carnsefin 300m along a quiet rural road to Ballyvaughan, Carran and an abundance of ancient wedge tombs, dolmens, ring forts and castles on your route to Corofin. Starting from Lahinch you have 2 options for your first days walk. You can either walk the full distance of 27km to Doolin or you can get a transfer to Liscannor to begin your walk. The walk from Liscannor to Doolin is 18km. 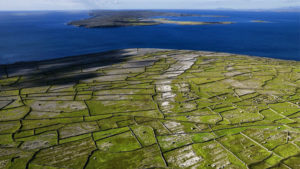 From Liscannor, the Wild Altantic way travels along the coast to the southern end of the world-renowned Cliffs of Moher. 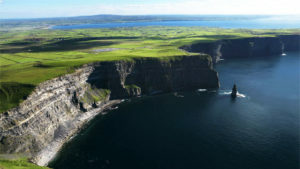 The Cliffs of Moher stretch along the coast for over 8km and tower 214m above the Atlantic Ocean at their tallest point. There is a visitor centre (entrance fee €6 not included) offering information about the area, cafes, souvenirs and bathrooms. Close to the visitor centre, you will find O Brians Castle. Entry to the castle (recently reopened to the public, entry fee is €2, not included) offers you access to explore the castle and a viewing platform on its roof. Leaving the visitor centre behind, you will follow the Cliffs of Moher north along one of the most spectacular cliff paths along the Wild Atlantic Way until you reach the small village of Doolin, renowned for its Craic agus Ceol Irish for Fun and Music. Important: This tour will travel through a Gaeltacht (Irish Speaking) area some of the road signs may be in Irish. As you walk from Doolin to Fanore you will be walking predominantly on boreens (Irish for rural roads) through quiet farm lands. After a gradual ascent you will be able to enjoy panoramic views of the Atlantic coast, looking out to the Aran Islands and down towards the coast of Fanore. From this point it is a short descent to the seaside village of Fanore and your accommodation for the evening. As you leave Fanore today, you will follow a boreen running parallel to the coast road around Black Head. A small lighthouse perched on the cliff top marks the most northerly point of your tour, from your vantage point on the trail you will have spectacular views of Galway Bay. You will continue your trek on The Burren Way contouring Doughbranneen and Glenbeigh both 300m, along a mountain track with great coastal views on your left. The track joins an old path leading you through the Gleninagh Valley. 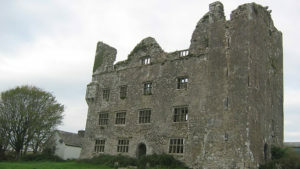 You will pass the 16th century Newtown Castle (the castle was restored in 1997) and walk across fields and woodland before arriving in Ballyvaughan. Ballyvaughan is the end of our Highlight tour. The first 5km of todays route on the Wild Atlantic Way will take you along the boreens you walked yesterday. As you leave Ballyvaughan you will be walking along a mixture of forest trails, mountain tracks and briefly through a bog. 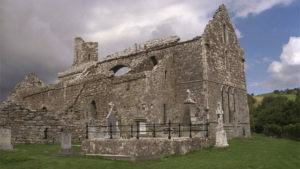 You will pass ancient monuments like Cahermacnaghten stone fort, Poulnabrone portal tomb and Cahergallaun stone fort to mention but a few, all examples remaining testament to continued settlement in the area throughout the centuries. Your route on The Burren Way today will mainly be along quiet rural roads, leading you past a wealth of historic monuments and natural points of interest like Caves, Cahercunnaun Ring Fort, Parknabinnia Wedge Tomb, with many others on or close to the trail (make sure you have your camera batteries fully charged). 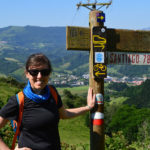 The trail is gently descending towards a quaint Irish village and around the beautiful Inchiquin Lough, before arriving at your accommodation for the evening in Corofin. After breakfast in Corofin your tour on The Burren Way comes to an end. There are regular bus service from Corofin to Ennis and from there to Dublin, Limerick and Shannon Airport (not included). 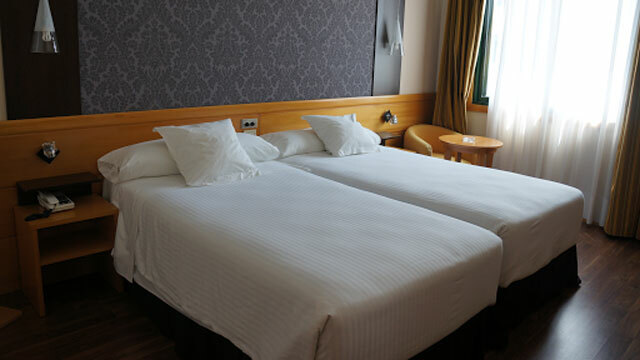 Talk to our travel specialists about arranging a transfer and extra night’s accommodation in the historic city of Galway. This beautiful and buzzy is a hot spot on the Wild Atlantic Way and still maintains some of its medieval charm with narrow streets, old shop fronts, ancient city walls, castles and cathedrals. There is an infectious energy in Galway and always something to see and do. Step 1: Shannon Airport to Ennis | Bus Éireann | Travel time 0H30 approx, outside the main terminal leaving every hour all day | Fare €6 each way. Step 2: Ennis (Ennis Bus Station) to Lahinch | Bus Éireann | Travel time 0H30 approx, from, leaving three times a day | Fare €8 each way approx. Step 1: Dublin Airport to Galway | Irish City Link | Travel time 2H45 approx outside the main terminal, buses departing every hours | Fare €19 each way. Step 2: Galway (Galway Eyre Square) to Lahinch | Bus Éireann | Travel time 2H20 approx, leaving three times a day | Fare €20 approx return. Step 3: Dublin CIty Centre (Busaras Bus Depot) to Lahinch | Bus Éireann | Travel time 5H40 approx, leaving three times a day | Fare €35 approx return. Step 1: Dublin City Centre (Heuston Train Station) to Ennis | Irish Rail | Travel time 3H00 approx, leaving every 2 hours | Fare €15-€25. Step 2: Ennis (Ennis Bus Station) to Lahinch | Bus Éireann | Travel time 0H30 approx, leaving three times a day | Fare €8 approx. Step 1: Corofin (Corofin Cross) to Ennis | Bus Éireann | Travel time 0H25 approx, leaving every 2 hours | Fare €4 each way. Step 2: Ennis (Ennis Bus Station) to Shannon Airport | Bus Éireann | Travel time 0H30, departing from every hour all day | Fare €6 each way. Step 2: Ennis (Ennis Bus Station) to Dublin City Centre | Bus Éireann | Travel time 5H20 approx, leaving every 2 hours | Fare €25 each way. Step 3: Ennis (Ennis Train Station) to Dublin City Centre | Irish Rail | Travel time 3H00 approx leaving every 2 hours | Fare €15-€25 each way. Step 1: Corofin (Corofin Cross) to Galway | Bus Éireann | Travel time 2H25 approx, departing every 2 hours | Fare €14 each way. Step 2: Galway (Galway Bus Station) to Dublin Airport | Irish City Link | Travel time 2H00 approx, departing every hour | Fare €19 each way. Irish City Link – Intercity Major Bus.